Happy Friday y'all! I'm seriously so happy its the weekend! Its been a crazy week for me. I had to pack up all my stuff yesterday and move because I am finally moving into my own place! (It's about time) So I'm just excited to relax and hang with friends and the boyfriend. 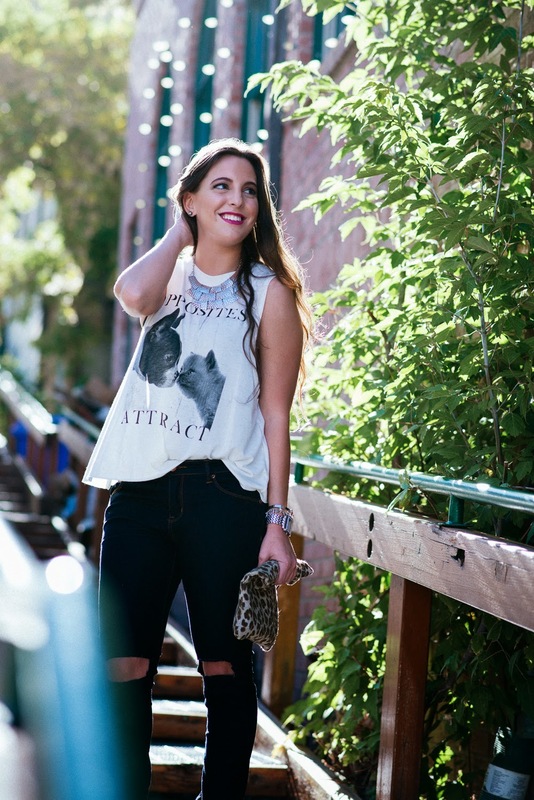 I'm really excited about today's post because its probably my favorite type of outfit to wear right now. 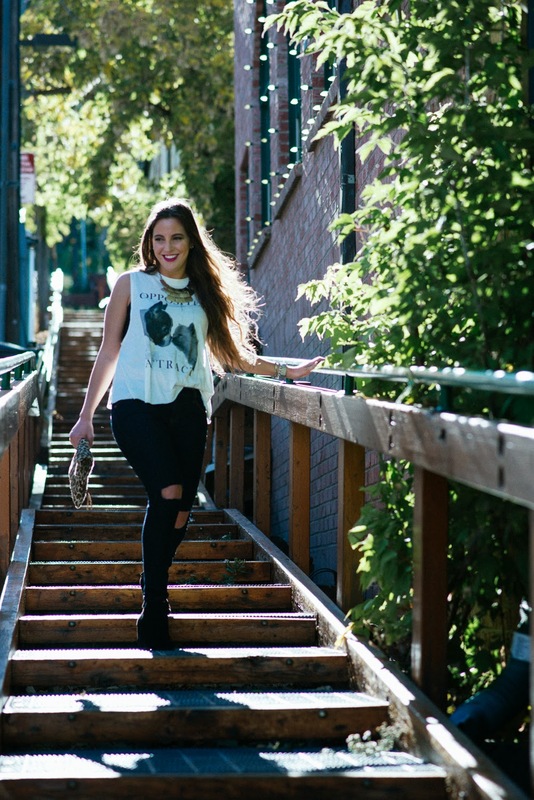 The amazing Haley Nord took these photos in Park City and I love them! So there's a little story behind this fun muscle tee from Forever 21. 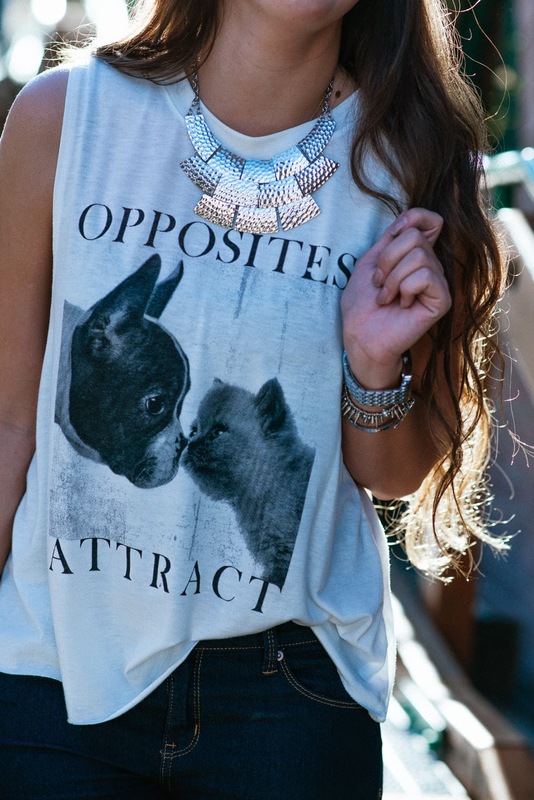 I went there specifically for jeans but on the way to the dressing room I saw this "Opposites Attract" tee and I instantly knew I needed it! Reason being? Because if you know me and Matt then you will know that we are complete opposites, not one thing in common except for that we love each other haha. We really are opposites that fell madly in love so I thought it was the cutest thing ever! I also ripped these holes in these jeans that I got there too, I only paid seven bucks for these things so I didn't feel guilty for doing it:)I really have been wanting jeans like this because I think it really makes the whole look really edgy! So I'm wearing these gorgeous black pearl earrings from Laguna Pearl and I love them. They are Tahitian South Sea Pearls and I love how they look! They have quickly become my favorite earrings to wear. They are ultra-chic. I love pearl earrings but this color of it has to be my favorite because its so different and matches my style better. 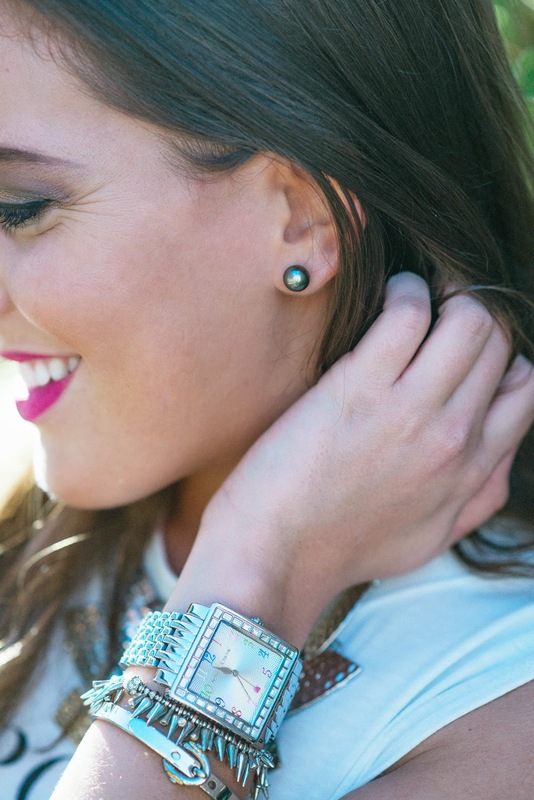 And pearls are one of those things that are so timeless and never go out of style. Check out all the pearl earrings they have here. Don't forget about the AMAZING Sole Society Giveaway!! Enter HERE!! Love your outfit! The metallic and the T is my favorite, I am a proud pup owner and the shirt is too cute. Love the black denim too!! I'm a huge fan of graphic t-shirts. 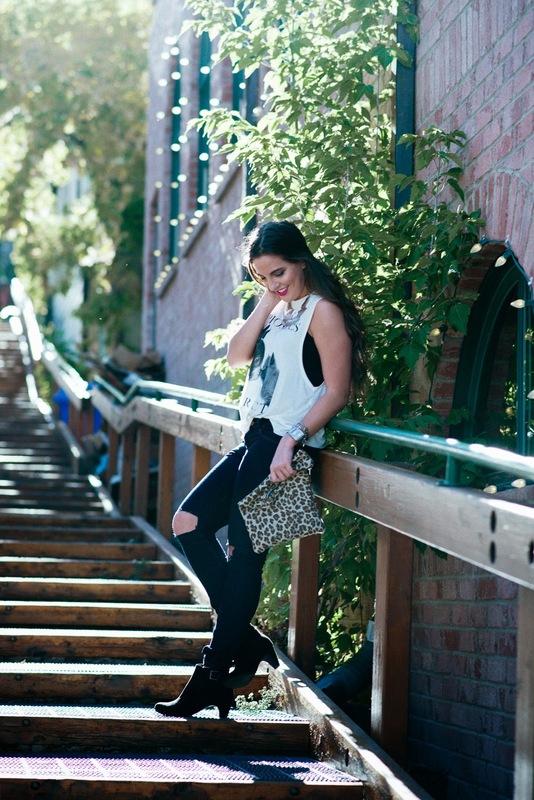 I love how you've styled yours with distressed black jeans. 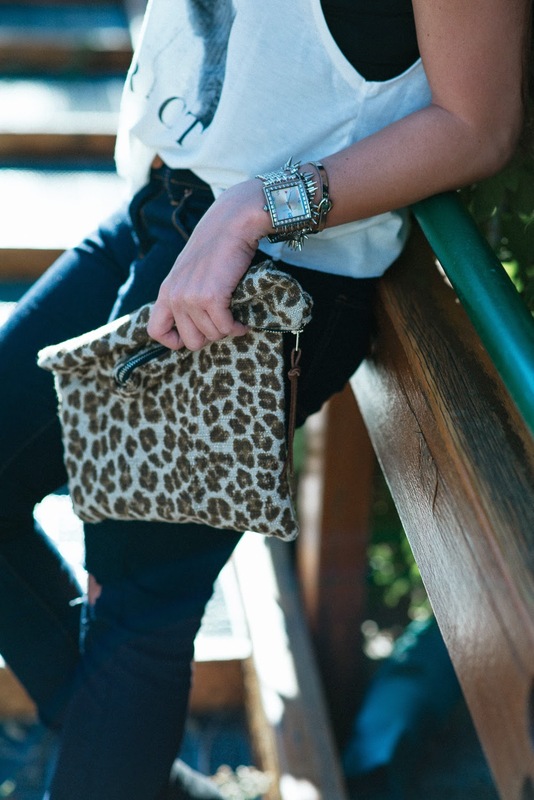 You can't beat a pop of leopard print to complete an outfit!